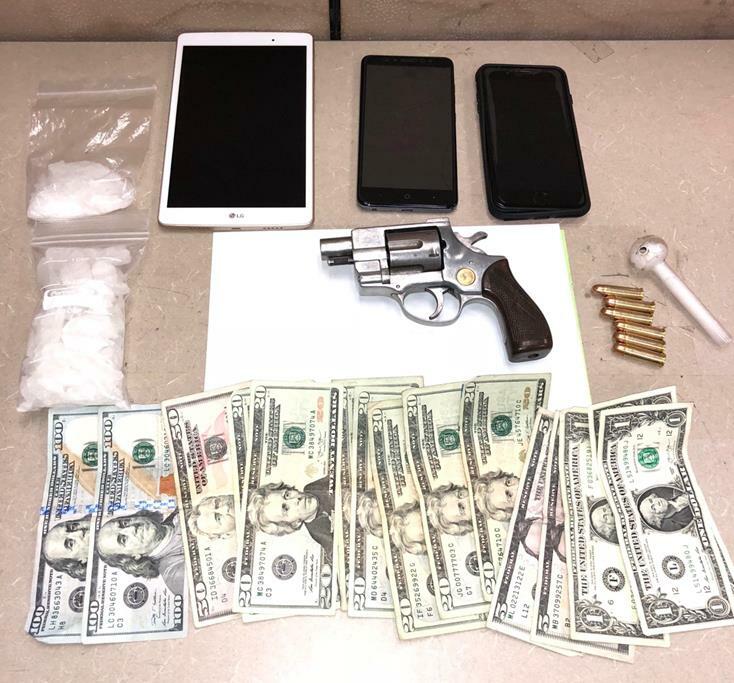 PALMDALE – A felon was arrested in Palmdale recently when a patrol deputy conducted a traffic stop and found a large amount of methamphetamine and a loaded .38 caliber revolver in the vehicle, authorities said. The bust happened in the area of 10th Street East and Palmdale Boulevard, after Palmdale Sheriff’s Station Deputy Aquino conducted a traffic stop for a vehicle code violation, according to a news release from the Palmdale’s Sheriff’s Station. “As the deputy was explaining to the driver his reason for the traffic stop, the driver appeared extremely nervous and made affirmative movements to the side of his seat. Fearing the driver was reaching for a weapon, the deputy had the driver exit his vehicle,” the news release states. “For his safety, the deputy conducted a pat down search for any weapons. The driver admitted to possessing drug paraphernalia on his person and was arrested,” the news release states. While inventorying the vehicle, the deputy recovered about 150 grams of methamphetamine, which has a street value of around $2,000, and about 7,500 individual doses, the sheriff’s department reported. “Wedged between the driver seat and the center console where the driver originally made affirmative movements, Deputy Aquino located a loaded .38 caliber revolver,” the news release states. The driver was previously convicted of several crimes, including robbery, brandishing of a firearm, transportation of a controlled substance and felon in possession of a firearm, the sheriff’s department reported. “The driver begged Deputy Aquino to ‘give him a break’ because he had two strikes on his record and this was his fourth time being caught with an illegal firearm,” the news release states. “[Deputy Aquino’s] proactive police work made the community safer by arresting a felon before he targeted victims. A dangerous controlled substance never made it to the hands of a possible overdose victim, and a firearm was removed from potentially being used in a robbery,” the news release states. The suspect’s identity was not revealed in the news release. 20 comments for "Felon arrested after Palmdale traffic stop yields meth, loaded weapon"
In Lancaster, the line gets blurred between serving the Lord and serving King Rex. When two local pastors do a survey for you so you can use the information to smear an African American veteran candidate, that is not doing the Lord’s work. What thanks to the churches get for supporting King Rex? They get pot farms when they begged him not to. I would have pity on the church goers in Lancaster, but you’re getting exactly what you asked for and deserve. He had a gun, I don’t understand isn’t it illegal for felons to have guns? Wow, a FELON just got arrested for possession of drugs and a weapon, and this piece of work Tim Scott is blaming cops for it? Unbelievable. Who is this guy anyways? Probably a criminal too? Or just plain stupid. The framers of our constitution said it was better for a hundred guilty men to go free than for a single innocent man to be imprisoned. Admittedly, getting rousted out of your car by a twitchy cop, probably put in a ‘secure position for the safety of the officer’ like seated on the ground, and endangered by a scared rabbit with a gun fetish, isn’t the same as imprisoned, but the principle still applies. Does getting this guy off the streets justify treating ordinary citizens that way? That deputy might have lied about quite a few things in order to justify asking the suspect to step out of the car and to search him. But I am ok with giving up some civil liberties to keep us safe. I once had a girlfriend who became an everyday meth user. I watched as her mental health slowly eroded… Now, 3 years later she is nothing like the person I once knew. I wish we could get all meth off the streets. Deputy Aquino’s violation of a citizen’s rights turned out well…this time…but we will never hear about the hundreds of times his fascist tactics netted nothing but the erosion of liberty. SPOKEN LIKE THE TRUE EX-CONVICT THAT YOU ARE. THIS GUY WAS PROBABLY ONE OF YOUR CELL MATES WHILE YOU WERE IN STATE PRISON,,, WASN’T HE-TIM SCOTT! Felons driving with vehicle code violations is common. They get high on their own supply; don’t even bother to conceal their product; keep a gun ready to use; have their scale on hand, along with baggies. Being a two striker isn’t a problem for him because he’s high when he does business, and thinks he’s invincible. Since you’re such an advocate of facts, Tim, let’s see your facts to back up your comment. So blame the cop and not the bad guy. Cop just doing his job. Thank You Sheriff for getting bad guys off the streets. So Tim you want bad guys who deal drugs and carry guns on the Streets? What the F is wrong with you? So, Ron, you want twitchy cops that “just feel scared” hauling people out of their cars at every routine traffic stop? What the F is wrong with YOU? As I said, this time it turned out well. We’ll never hear about all the times that it doesn’t. We have laws for a reason, and if the cops can’t be counted on to follow them who can be counted on? Why should anyone? Stick with this article, Tim, instead of painting with your very broad brush, now including every routine traffic stop. Do you have PROOF that this particular Deputy did not do his job properly? This isn’t about ALL the other times. You obviously have taken the law into your own hands and pronounced this Deputy guilty. Facts don’t matter to you, therefore you have no respect for the law. Labeling Deputy Aquino by irresponsibly using the word “fascist,” when you have no idea what this man is about, is appalling. You are very careless when it comes to denigrating others, while at the same time, hypersensitive when others criticize you. Your words are dangerous, and you thrive on casting blame on others. You would be the one that would hang someone before due process, which by the way applies to all. Even the one’s you don’t like (all Law Enforcement). This guy is a felon a robber, drug dealer ,who has a gun. Yes I want these dangerous people off the streets. Police never bother me ever. I have not had a ticket in 25 years. This was at a checkpoint to keep drunks off the road. If they happen to get a dangerous felon off the streets then God Bless Our Sheriff Department. What’s wrong with liberals always defending the bad guys. THANK YOU AV SHERIFF. GOD BLESS!!!! Liberals are mental. How do you know anything about this cop Tim? Do you have any proof that this cop behaved Badly? Or you just a dumb lib that hates cops. The proof is right here in the article. As I have said repeatedly, the outcome this time just happened to be good, and I’m fine with the outcome. That doesn’t mean that allowing cops to operate beyond their legal authority is a good idea. No Tim, there isn’t “proof” in the article to support another of your cop bashing stances. The multiple felon criminal was doing something with that gun. Was he possibly reaching to use it? Maybe. Was he reaching to further hide it? Probably. Either way it was a suspicious activity warranting the deputy to order the suspect out of the car which is completely legal. The deputy was able to pat down the multiple felon criminal who had drugs on his possession. At that point your vehicle is getting searched. The deputy finds drugs and a gun on a guy whose priors are…burglary, brandishing a firearm, possession of a controlled substance, being a felon in possession of a firearm and he admitted to already having two strikes. In Tim’s east palmdale world, once again, the dangerous person here is the deputy. To “Just here” – Could it be because a certain race is responsible for most crime in the AV? I refuse to walk down 10th St East to sam’s liquor past 5pm anymore and its NOT the whites or hispanics I am worried about. Before you even have the facts, Tim, you are accusing Deputy Aguino of violating this person’s civil rights. Not only that, but you are accusing him of using fascist tactics hundreds of times. Your credibility is zero, Tim, when you choose to condemn a person on just what you say with zero proof.